The final few days of March was special for my family and friends because we went on vacation in the mysterious and far-off Mindanao region. Since our drop-off point was at Cagayan de Oro, Bukidnon was just about an hour away and so it became part of our itinerary. 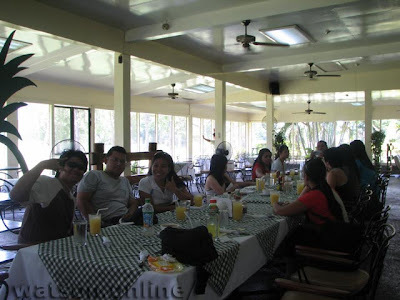 And that part of the trip was special because we were eagerly anticipating the popular roast beef of the Del Monte Golf and Country Club! 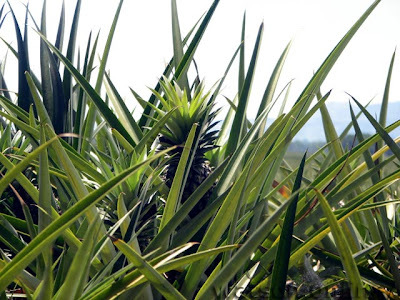 The moment we saw pineapples as far as the eye could see, we knew that we were already in the Del Monte pineapple farm. It was such a wondrous sight! I think we could opt for a tour and see how pineapples are processed and canned but we were a bit tight on schedule so we just stopped by for some amazing photo ops and of course, the food! We arrived at the Clubhouse soon enough. And because we all wanted a taste of the famous roast beef, we ordered for each one of us. Bad decision! Each order was more than enough for one person. The order came salad and soup. The soup was good, but I was not so keen on the sweet sauce that came with the salad. But the roast beef! Wow. It was amazing. Tender and beefy! (no pun intended). I wonder when I can have another meal like that. 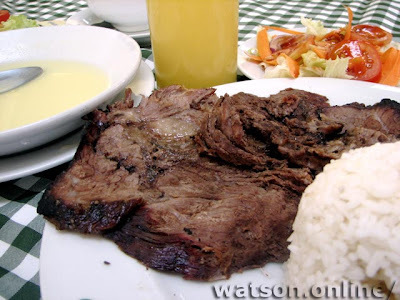 The roast beef meal set us off at around 250 pesos each. But I'm sure it would have cost around three times more here in Manila. Having filled our tummies, we headed off for our next destination, while feeling that our vehicle must have considerably slowed down because of our additional weight. Am not a huge beef fan but that piece of meat got me a bit disoriented! YUM! i love beef, kahit na bawal. forgive me for i will continue sinning, hehehe. really great food pics you got!